Larry Johnson (left) is the beer styles columnist for Southern Brew News. Dustin Watts (center) is with Terrapin Beer Company in Athens. Terri (right) is a beer lover from Chapel Hill, NC. 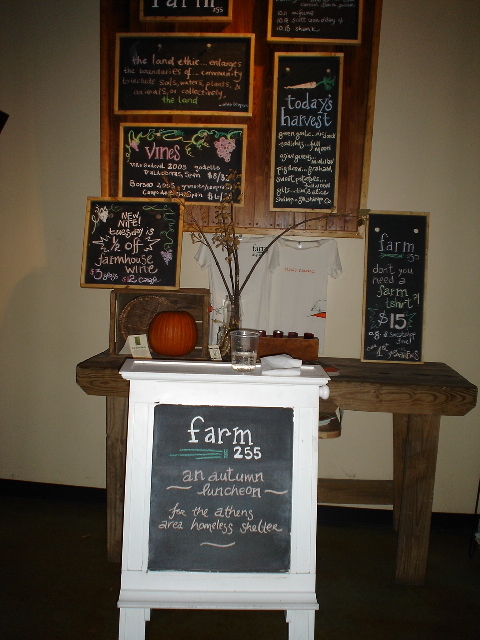 for hosting our blind tasting. 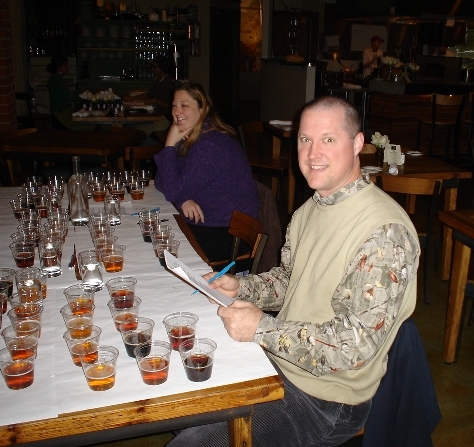 Owen Ogletree (director of Brewtopia Events LLC) gathered together fellow beer lovers Dustin, Terri, Kerri, Larry and Jeff on November 21, 2006 at Farm 255 restaurant in Athens, GA to sample and comment on several mixed styles of specialty ales and lagers made by Anheuser-Busch for the 2006 holiday season. No one was aware of the brewer or the brands of beers that were being tasted. 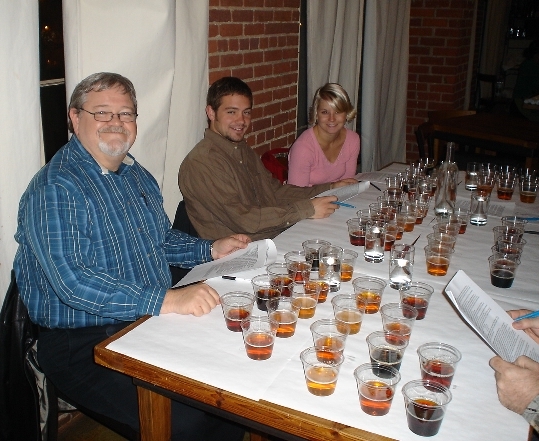 Products were informally commented upon according to Beer Judge Certification Program (BJCP) style guidelines. See the bottom of this page for a comprehensive article from Owen regarding the ingredients and flavors of many of these new brews. Drop Owen an email to share your comments and opinions. Appearance: Dark gold; very clear; mild white head. Flavor: Malty with hints of fruit; mildly grape-like; grainy; light in body for a big beer; slight toast notes; dries out a little on the tongue; alcohol hints - slightly warming; well attenuated; mild toffee notes; hint of pleasant hop bitterness; very drinkable and elegant. Slight overall sweetness. Very pleasant. Aroma: Hint of American hop aroma; very light, mild aroma overall. Appearance: Clear; dark golden color; attractive, light white foam. Flavor: Creamy body; very little caramel malt character; slightly dry on the tongue; flavors go away quickly; a bit watery; very light malt and hop flavors. Aroma: Good aroma for this style; malt; clove; banana; spices. Appearance: Slight haze is great for style and makes the beer very attractive. Gorgeous white head. Flavor: Good medium body; slightly sweet finish; clove and other complex phenol and ester hints; a bit mild in flavors for style, but all the basics are here. Some thought it might be slightly bitter in hop finish for style. Aroma: Very mild, light aromas of malt and hops. Needs more hop aroma. Appearance: Nice, golden and clear. Mild white foam with no haze at all. Heavily filtered. Flavor: Dry; slightly bitter; mild malt; not much hop flavor at all; not very complex in its malt or hop profile. Could benefit from more hop flavor and malt complexity. Aroma: Slight citrus, piney hop notes. Appearance: Dark gold; attractive; extremely clear and filtered (overly); good head retention. Flavor: Some hop flavor; slightly estery (fruity); mild and slightly sweet; a bit thin in body for style; pleasant and clean; not quite the depth of complexity and flavors of a typical American pale ale. Some complexity and body may have been removed by extensive filtering. Aroma: Mildly roasty; cocoa; dark malt; dark bittersweet chocolate; hint of brown sugar. Great for style. Appearance: Dark in color with ruby notes; tan foam; dark chestnut highlights. Flavor: Very tasty, slightly sweet, cocoa notes. Very mild chocolate flavors; caramel hints; toffee malt flavors; very good mouthfeel and body for style (medium). Not extremely three dimensional in terms of flavor, but has all appropriate characteristics of a good Brown Porter. Very drinkable. Aroma: Cinnamon; nutmeg; mace; pumpkin hints; ginger note. Appearance: Nice white head; orange color; very clear. Flavor: Spices are prevalent; body is a bit lighter than expected; pumpkin flavors are mild; cinnamon is up front; could use a bit more malt and pumpkin to be really satisfying and robust for style. Very clean and drinkable. Aroma: Vanilla; oak; alcohol notes; a touch medicinal; hint of rubbing alcohol; vanilla extract-like in the nose. Appearance: Very clear; light white foam; ruby / amber in color. Flavor: A bit candy-like; cordial liqueur notes; vanilla extract overtones; sweet finish; lots of caramel; light brown sugar; oak is very mild; alcohol is hidden. Aroma: Sweet cocoa; dark bittersweet chocolate; cherry cordial; hot fudge. Appearance: Very dark red / brown color. Mild head. Flavor: Chocolate cherries and vanilla. Very cordial-like; great dessert beer but not very cloying. Chocolate lovers should enjoy this beer. Not much of a mouthfeel for 8.5% alcohol; not very rich in body or complexity, but flavors that are present are very pleasing. Could be improved by making it a touch more rich, thick, malty and creamy. Good chocolate flavors. Aroma: Slightly fruity; very little aroma at all. Appearance: Dark amber color; very clear; overly filtered; light carbonation. Flavor: Very mild flavors; hardly any wood or vanilla notes; very light flavors; lacks depth and complexity. Could really benefit from more complex malt and wood flavors. A bigger body and alcohol content would also help improve complexity. Microbrews and craft beers are all the rage these days, and in response to increasing nationwide sales of these flavorful beer styles, Anheuser-Busch is bucking their light lager tradition by releasing eight new specialty beers that will be available in the Athens market this holiday season. This is an ideal chance for loyal Budweiser drinkers to be bold and experience the flavors of some new malt beverages from their favorite brewery. Jack's Pumpkin Spice Ale is a golden ale made with Oregon pumpkins. This is a subtle specialty beer with a pleasant hint of pumpkin and seasonal spices such as cinnamon, ginger, nutmeg and clove that are added directly to the brew kettle. Jack’s Pumpkin Spice finishes slightly sweet and pairs well with pecan pie or cheesecake. Michelob Porter will be part of the new Michelob sampler pack and has a luscious dark color with ruby highlights and an elegant cocoa aroma with a hint of coffee. There is also a mild espresso flavor, a spicy hop background and a dry finish. Michelob Bavarian-style Wheat is a good example of a traditional, refreshing Bavarian wheat ale that is cloudy in appearance and slightly dry in the finish with characteristic banana and clove notes in the aroma and flavor. This golden beer is produced using barley and wheat malts and is not filtered before bottling. Michelob Celebrate Chocolate also registers a mighty 8.5 % alcohol and is brewed with caramel and roasted malts and has cocoa beans added to the maturation tank. The taste is reminiscent of semi-sweet chocolate with a coconut liqueur note. Serve slightly chilled (not cold) to really appreciate the complex flavors. Michelob Celebrate Vanilla Oak features distinct vanilla, caramel and oak flavors. Vanilla beans from Madagascar are a part of the recipe, and this brew comes in at 10% alcohol. A richer, fruitier and spicier version of this beer is matured with wood from broken bourbon barrels and is called Winter's Bourbon Cask Ale. Stone Mill Pale Ale is an organic beer with a floral/citrus hop aroma and a light malt background. The beer utilizes an interesting combination of American and European hop flowers that provides a marriage of citrus and spicy/floral hop character. This offering tastes almost like a fruity, Bohemian pilsner with a hint of grapefruit. 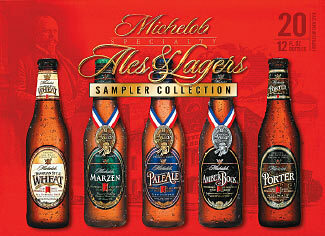 The Michelob seasonal beers are available in a 20-bottle variety pack that includes the standard Amber Bock. 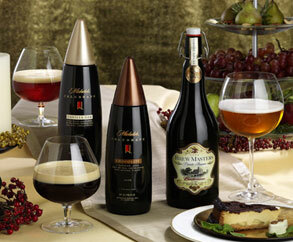 The Michelob Chocolate, Brew Master’s Reserve and Vanilla Oak beers are part of the Celebrate Series and are being sold in grand, champagne-type bottles. Jack’s Pumpkin Spice has been available in past years as a draught offering, but is now on the market in a six or 18-pack configuration. These special brews will be available only during the holiday season – with the exception of the organic Stone Mill Pale Ale that can be purchased in six-packs year-round. George Reisch, brewmaster for Anheuser-Busch says “Beer is one of the most versatile, moderate alcohol beverages in the world, and even pairs well with a range of festive cuisines by complementing, and not overpowering complex flavors.” Holiday revelers are encouraged to incorporate elegant, handcrafted beers into their celebrations. Without reservation, many beer connoisseurs consider rich, delicious, specialty beers (such as the ones discussed above) to be the ultimate holiday “bubbly” of choice. It seems as if the brewers of Anheuser-Busch are now in agreement.